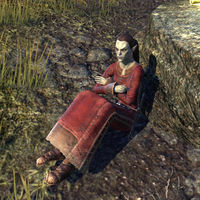 Dandrii Dran is a Dunmer found in the Quarantine Serk. She is Gorvyn Dran's cousin. A Letter for Deshaan: Deliver a letter to a refugee's cousin in Deshaan. "Who knew that so many afflicted would flock to the Serk! All these people. They're so … sick." Your cousin asked me to give you this letter. "A letter? From my cousin? That's wonderful news! I'm glad to hear he made it to Stonefalls safely. Thanks for bringing this to me, friend." "I was so relieved to get that letter from my cousin. Between knowing that he's all right and hearing that the Maulborn have a cure for this plague, I'm feeling so much better." "So Dethisam and Aerona were right? The Maulborn are nothing more than ... common swindlers! I am so angry right now I feel like knocking heads together!" What can you tell me about the Maulborn? "Well, I'm not one of their recruitment liaisons, but I can tell you a little. They claim to be an altruistic organization, formed to help the common people of Morrowind." "What's to understand? They're a volunteer organization. They say they fill the gaps left by the Tribunal and the Great Houses. They set up the quarantine here to help the afflicted. Claim to have a cure for the plague. But that's all I know." This page was last modified on 12 March 2019, at 23:01.